Our recent feature on Ibiza’s beer wine and spirit manufacturers sparked quite a lot of interest. Having looked at some of the suppliers we thought a more in depth look at Ibiza’s wine making history and culture. Quite a long history it turns out to be, with vine growing and wine production recorded as early as the 7th century BC. With 2700 years’ experience, we must know what we are doing. The area where grapes are grown and wine is produced with the Ibiza regional wines label is the island that lends its name to this geographical indication. Vine growing and wine production on the island of Ibiza dates back to the 7th century B.C. during the period of Phoenician activity here. Drinking vessels and amphorae have been found from the period that was used by the Phoenicians for storing Ibizan wine. According to Juan Piqueras (1986), during the Punic period, most wines consumed on eastern mainland Spain, in what is now known as the Valencian Community, were transported there from Ibiza in Phoenician amphorae. In Punic times the inhabitants of Ibiza had quite a good knowledge of vine-growing and wine-producing techniques, to the extent that, according to Pedro Saez (2001), it was the islanders who introduced viniculture to nearby mainland areas. The presence of Romans on the island led to improvements in vine growing and wine production, with the introduction of new growing techniques and improved wine-making systems. The 19th century was the peak period for viniculture. In 1862 France, a leading producer and consumer of wine, was plagued by philoxera. As a result, the country was forced to import massive quantities of wine. Given Spanish wines’ reasonable prices and the ease with which they could be sold for distribution in France, this represented a big boost for the sector. Reds: Monastrell, Ull de Llebre, Cabernet sauvignon, Merlot, Syrah. Whites: Macabeo, Parellada, Malvasia, Chardonnay, Moscatel de Alejandria, Moscatel de grano menudo. According to information recorded by Archduke Louis Salvator, in 1867 there was an important vine-growing and wine-making business on Ibiza, with vines covering an area of over 45 hectares and wine production reaching a figure of 232 hl. In the late 19th century philoxera began to appear in the region, killing off the vines. 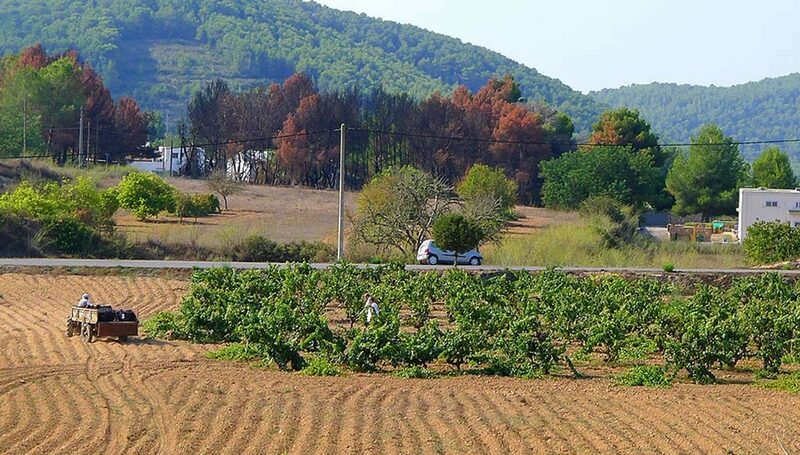 This, plus later EU incentives to pull up large numbers of vines in exchange for subsidies, has greatly hindered the recovery of the vine-growing and so the Ibiza wine making business. Even so, Ibiza’s agricultural workers persisted throughout the 20th century, continuing the business up until the present day. Proof of this is the “Sant Mateu Wine Festival”, held in December in the town of San Mateu. At the festival, which is attended by people from all over the island, vine-growers present the new young Ibiza wine. However, it was not until the 1980s that the real wine revolution began in Ibiza, when two wine producers who grew their own grapes decided to place their bets on quality and invest in modern technology for their wineries. An important landmark in the history of Ibiza wine is November 15th 1996, the day when the Government of the Balearic Islands approved Decree 197/1996, by virtue of which the vine-growing region of “Ibiza” was created and use of the Ibiza regional wines indication was regulated. They are required to have a total minimum acidity of 4.5 g/litre of tartaric acid, with a volatile acidity no higher than 0.8 g/litre, expressed as acetic acid. In the year 2003, with the promulgation of Decree 54/2003, which repealed Decree 197/1996, a new regulation was passed regarding the use of the “Vino de la tierra de Ibiza” indication. This incorporated the possibility of wines made with one single variety of grape, using Cabernet Sauvignon, Merlot and Syrah for the reds and Malvasía and Chardonnay for the whites. Ibiza regional wines – Balearic Islands – Agrifoodstuffs, designations of origin and Balearic gastronomy also introduced new quality parameters and a new quality control system. At present only a limited number of wines are produced with the Ibiza regional wines indication. Consequently they are directed at a select group of clientele and are not easily available in all markets. dolomites and loams, the land is mainly composed of reddish-brown clay soils with a horizon with a chalk crust. 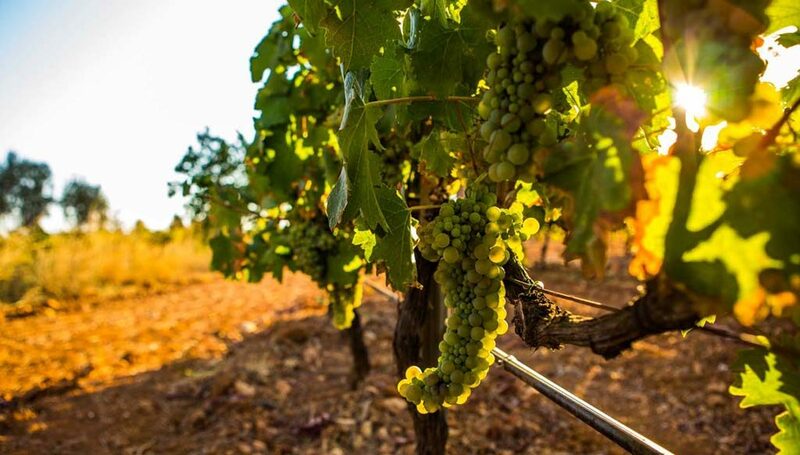 This wine-producing region has a dry subtropical Mediterranean climate, characterized by many hours of sunshine, hot humid summers and winters with mild temperatures. It has a low rainfall, concentrated in the autumn months. From among the different wines with a Ibiza regional wines geographical indication, we should highlight the reds made with Monastrell grapes, a variety traditionally grown on the island with a good degree of adaptability. These are clear, bright, cherry-red to dark-cherry coloured wines, with a predominance of aromas reminiscent of ripe fruit (strawberries) and strawberry fruit gums, and a hint of perfume (above all thyme, on occasions). All bottles with a “Vino de la tierra de Ibiza” geographical indication are issued with an official control number allocated by the Directorate General of Rural and Marine, which is responsible for the certification of wines entitled to use the “Vino de la tierra de Ibiza” indication. Traditionally thyme has been used to prevent the fermentation vats from becoming blocked and so it could be said to be an especially identifiable feature of Ibizan wine. In the mouth these are full-bodied, heavy, well-rounded, warm wines with a long finish and a hint of liqueur-preserved fruit. As for the whites, the ones that stand out are those mainly made with Macabeo grapes. These are wines with a good lemonish or straw colour with aromas of ripe fruit (apples) and flowers. They have a fresh, refined, well-balanced flavour, passing well through the mouth and ending with a very ripe fruity finish.